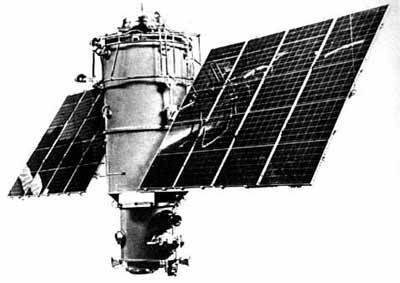 The Meteor-1 series was the first series of Soviet meteorological satellites. These satellites were developed by VNIIEM. They consisted of a 3-axis stabilized pressurized body powered by two articulated solar panels. TV (TV optical instrument, MR-600A), a vidicon based visible light imaging instrument. It operated in the spectral range of 0.4 - 0.8 µm. It had an ground resolution of 1.25 - 3 km with an swath width of 1000 km. IR (TV Infrared instrument, Lastocha), an infra-red imaging instrument operating in the spectral range of 8 - 12 µm. It had an ground resolution of 15 km with an swath width of 1000 km. AC (Radiation Budget Sensor), an narrow-sector device which to measures the sun's radiation fluxes, the thermal radiation of the Earth's surface, cloud cover and the atmosphere. The instrument operated in the spectral range: 0.3 - 3 30 µm. AC had an ground resolution of 40 km × 50 km with an swath width of 2500 km. Four satellites were used to test plasma thrusters in space. Meteor-1 10, 19 and 25 carried SPD-60 thrusters and Meteor-1 27 carried SPD-50 thrusters. These satellites were orbited by Vostok-2M launched both from the Baikonur and Plesetsk cosmodromes. Due to the lack of performance of the launch vehicle, they were put into non-sun-synchronous polar orbits with a average altitude of 650 km for the first nine satellites and 900 km for the later satellites. Orbital inclination was 81-82º. There were 11 satellites launched under the Kosmos designation and 25 more under the Meteor-1 name. Six more satellites - Meteor-1 18, 25, 28, 29, 30 and 31 - were in fact part of the Meteor-Priroda series. The Meteor-1 series was replaced by the more sophisticated Meteor-2 series.